Girls Over The Knee Cable Knit Socks. Gray & Ivory. Fits Shoe size 3-4. size Large. NWT from the original Gymboree Happy Rainbow Collection. 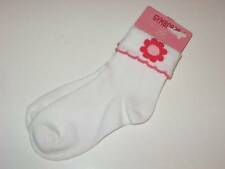 Little girl's Size 3-4 white cuffed socks with large coral flower and scalloped cuff edge. I do my best to point out piling or wash wear, and any stains I notice. GYMBOREE COWGIRLS AT HEART SOCKS. Adorable white socks with hearts and peace signs. 75% Cotton, 15% Nylon, 8% Polyester, 2% Spandex. no smoking. Assorted allover prints. Reinforced toe and heel. Winter Penguin Line. from Gymboree's. Ivory bow tights. All used clothing is washed inside-out on gentle and hung indoors to dry. We are no longer pet-free as we have a cat that was adopted from the Humane Society. 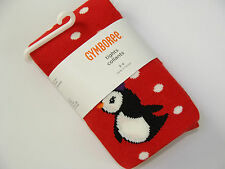 NWT Gymboree Winter Snowflake line are 3 pairs of Snowman/Polka Dot Socks, sized 3-4 years. Shoe Size 9-10 toddler. Machine washable. non smoking. Item # 140080792. I take one picture then I list all of the sizes that I have. Butterfly Blossoms. Basic Magenta Knee Socks. I take one picture and list all the sizes I have. Line: Panda Academy. Picture shown may not be actual size. This is for your protection. I will be happy to work with you! Condition: NEW. Gymboree "Palm Springs" Green Pom Pom Socks. NWT ~ size 3-4 yrs.